America Movil's three US unlimited brands; Straight Talk, NET10 and Telcel America have relaunched their CDMA BYOP (Bring Your Own Phone) web sites at www.straighttalkbyop.com, net10byop.com and telcelamericabyop.com respectively. These sites are supposed to allow you to activate CDMA phones on the three brand's $45 to $65/month Verizon based unlimited plans. 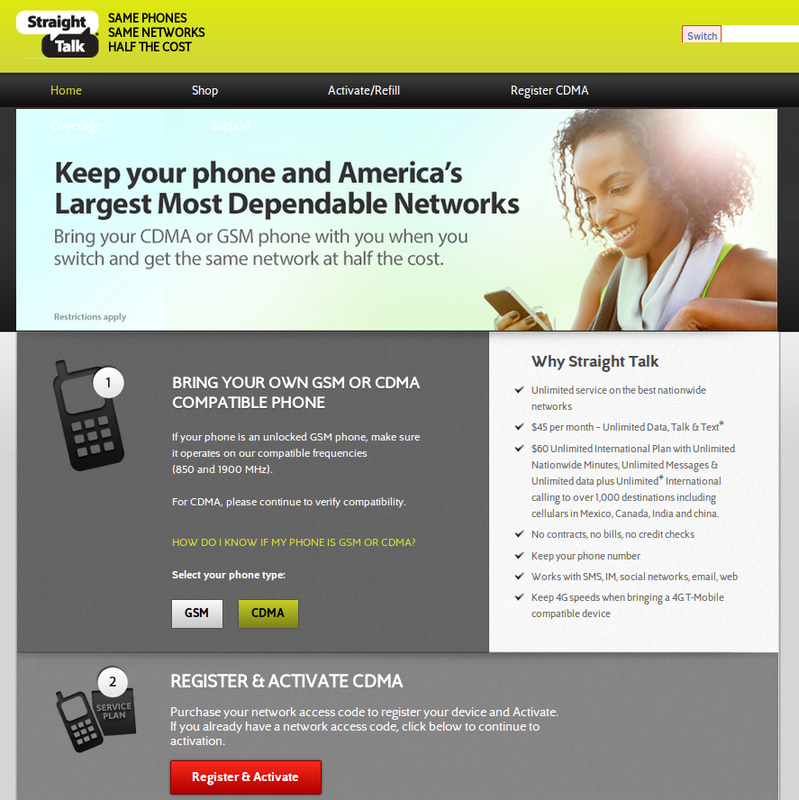 Wording on the sites suggests that any CDMA phone can be activated, with the exception of LTE capable phones and BlackBerrys. That means that, contrary to earlier reports, CDMA iPhones can be activated with the exception of the iPhone 5 which is an LTE device. 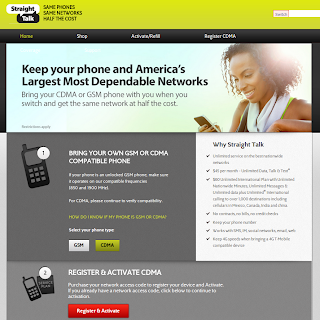 The three CDMA BYOP sites were initially launched in early April. They were taken offline after about a week, reportedly to fix technical problems with the sites and the activation process. Although the sites are up again, I haven't heard of anyone successfully activating a phone using them yet. All attempts seem to fail with an error at some point. "We are experiencing technical difficulties at this time. Please wait 5 minutes and try again." Immediately after entering the required information (MEID, make, model, zip code and whether the phone is currently active). I suspect this error means that only Verizon CDMA phones can used. I had better luck with a Verizon Palm Pixi Plus where I got as far as a page where I needed to enter my credit card details. I didn't go any further because I don't actually want to activate the Pixi. However I've seen several reports by users that activation failed with an error after they submitted their credit information. If anyone successfully activates a CDMA phone online with Straight Talk Net10 or Telcel sites please let us know with a comment. Update 5/30/2013: The Ameica Movil CDMA-BYOP activation pages are still erroring out frequently, but recently several users have reportedly that successfully activated Verizon Android phones. I have not heard of any successful iPhone activations however. Update 7/17/2013: According to multiple NET10 and Straight Talk representatives iPhones are officially no longer allowed on NET10, Straight Talk or Telcel America CDMA BYOD. Numerous users who have tried to activate iPhones have all reported failure. iPhone MEID are being rejected by the activation system. Net 10 has their coverage maps right, but telcel and straight talk have the CDMA and GSM map mixed up. It's interesting that as early as this morning the ST facebook page reps are still saying that the BYOP CDMA is not available. Hmmmmm! When this gets going it will be a great deal! Any word on US Cellular phones ? They are CDMA. I haven't heard of anyone trying to activate a USC phone. Given that Sprint phones don't work it's unlikely a USC phone would be allowed. If it worked the phone would probably need to be flashed to get data and MMS working. Pffft! Forget Carlos Slim and America Movil. There is nothing really "unlimited" about Straight Talk. Your data can get throttled or cut off arbitrarily. I'm sticking with Page Plus Cellular. I'll gladly pay 69.95 per month for 5GB of data that I can use to stream if I should so choose. Page Plus is a deal, and you can even tether without any fear of penalties. The new Aio plan will have 7 GB data for $70. Right now, I woudn't trust them with anything, on any network. There is something going on with America Movil's U.S. operation, so I highly recommend you guys stay put for at least a few months. That being said, why, on god's green earth y'all have to jump thru hoops, and insist on stupid BYOD stupid restrictions that Verizon/Sprint forces on you, when you can get an AT&T/T-Mo, or one of their MVNO, and can use ANY phone you want? Granted, Verizon network used to be MUCH, MUCH better than the others, but the rest of the pack have closed the gap CONSIDERABLY, and there is very little difference between Verizon and AT&T, or T-Mo and Sprint. If you ever leave home, your would not even say AT&T and Verizon in the same sentence, Verizon has the superior network. Depends on where you call home. Check out the Vzw and AT&T coverage maps side by side on this site. Anybody with eyes that work a little can see lots of places where there is no Vzw service, home or otherwise, and good AT&T service. And without an expensive Vzw LTE phone and an even more expensive postpaid plan, you are stuck in the slow data lane with Vzw's 3G and 1RTT network. CDMA carriers have let their aging EVDO systems get practically obsolete and bet everything on 1st gen LTE. Found any Vzw LTE on prepaid? I agree with the 3:59 PM post -- as good as Verizon is, they have a few significanr "holes" in their native network (namely, parts of Wisconsin, Oklahoma, and the I-65 corridor from Fort Knox, KY to the Tennessee border). While VZW works extensively with the rural CDMA carriers in these locations to provide LTE, roaming, etc. for each other's customers, the prepaid crowd is left out. Yeah, all those Straight Talk iPhone users who paid $650 and find their phones are slow cause they can't use LTE. "What can I do?" Well, you have to get an AT&T or MVNO SIM card and use the AT&T, or in some places the Tmobile network to go as fast as possible. "What? I read that Verizon has the superior network?" Verizon also has very large gaps in Southwest and central Texas, South Dakota, S.E. New Mexico, Eastern Washington, West Virginia, Western Virginia, Eastern Missouri, and Louisiana. It is pointless to tell people who live in places like this "Verizon has the superior network." No, they do not want to pay PagePlus 29c/minute to use their phone if roaming is available. Actually, though they do not offer phones on it at this time, Verizon prepaid does offer LTE for tablets. As for Att, ALL of their high speed 4G prepaid data is hspa plus, whether Gophone, AIO or mvnos. Sprint offers byosd (Bring Your Own Sprint Device) and LTE on their mvno Ting but their LTE coverage is paltry compared to Verizon or even Att. Straight talk AT&T Sim does not use Lte,hspa only. tried to activate Motorola A-955 and got to credit card page about 20min ago and then after waiting to process for a while got error page. I have PPC, and I have noticed the "surperior" VZW network, that I roam just south of Omaha, all they way to St. Joe, MO...or in KS, or in OK, and all the other states that are mentioned. I like the company, but I do not want to pay for roaming. I will either go to Next G (anyone on there yet?) or an ATT MVNO to remedy the issue. No data roaming for AT&T, though.. So has anyone activated one of these successfully yet? I try to activate a Verizon iphone, and it just keeps spinning the status, I almost give up. So say you almost gave up so that means you didn't give. What eventually happenend? Error or successful activation? How about phones from Verizon prepaid? I think they had to have been used on Verizon prepais for 90 days? so no new ones I am almost poitive. Verizon prepaid phones aren't allowed on other Verizon MVNOs but the Straight Talk site doesn't say they aren't allowed. I don't think we will know until the Straight Talk BYOP site actually works and someone tries to activate a prepaid phone. I thought I would post on here my experience with getting my access code on Net10. I was unable to complete the credit card portion of my purchase so I made a call to the 800 line (FYI: Call early in day). I was transferred once and I got a CS rep who was really knowledgeable. I am already a Net10 customer and have an existing online account but he got around an issue by creating an alternate account with another email. He completed the purchase and then made the transfer to my new phone (Samsung Fascinate). It only took about 5 minutes and my new phone was up and running. I then used the esn to add the new phone to my old, existing online account. I hope this might help anyone who is having trouble with the credit card purchase. between at&t and verizon, the coverage and call quality is fantastic.